With massive powers to store carbon, forests have a big role to play in mitigating climate change and fulfilling Paris Agreement commitments, which includes halting deforestation. Policy support to curb this tree loss is mounting and CDP says companies joining this sustainable and deforestation-free movement are putting themselves in an advantageous position. Originally posted on the CDP blog. 28 April 2016 | The Paris Agreement, which saw a record-breaking number of countries sign last week, sets the target of limiting global warming to within two degrees by the end of the century. In order to achieve this it is essential that emissions reductions are made, and quickly. 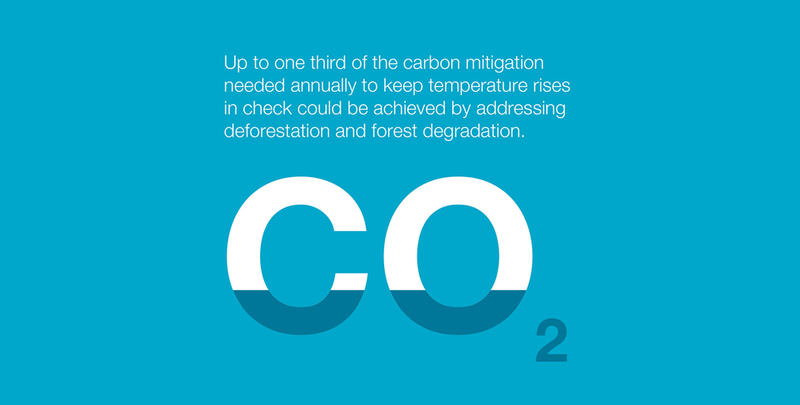 Up to a third of effective carbon mitigation is achievable through directly addressing the loss of trees. 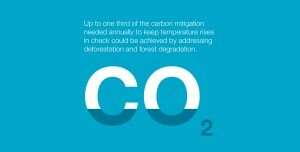 This makes halting deforestation one of the most cost effective means of tackling climate change. As well as reducing the natural ability to capture and store carbon, deforestation and forest degradation also often emits carbon already stored. For instance, Indonesia’s GHG emissions from forest fires alone approached the total annual emissions of Brazil last year. So what does this mean for business? Common deforestation risks include supply chain resilience, reputation, regulatory change and – increasingly – access to capital. These risks are so serious that 70% of companies taking part in CDP’s forests program have committed to reduce or remove their impact on deforestation and forest degradation. It now seems that promises are turning into greater action. Recently, Mars and Unilever, amongst other companies, dropped palm oil supplier IOI due to unsustainable forest management practices. More recently still, the Roundtable on Sustainable Palm Oilordered the cessation of new plantation development in the Peruvian Amazon by Plantaciones Pucallpa. Despite this traction, a great deal more progress is needed. Half of the companies disclosing to CDP that have deforestation commitments to source certified sustainable soy are yet to introduce any, whatsoever, into their supply chains. In the case of palm oil, this figure is a quarter. 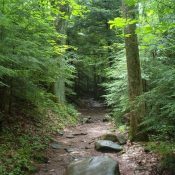 The Paris Agreement also directly references the need for more sustainable forest use. Article 5.1 specifically states that parties should take action to “conserve and enhance, as appropriate, sinks and reservoirs of Greenhous gases… including forests.” Article 5.2 calls on parties to take action towards “reducing emissions from deforestation and forest degradation”. Over 80 of the INDCs submitted to the UNFCCC mention land use, land use change and forestry. Brazil, for example, is the world’s 5th highest GHG emitter in the world and 78% of these emissions are due to land use, land use change and forestry. Brazil’s INDC commits too eliminating illegal deforestation by 2030 and restoring 12 million hectares of forest. With this emerging regulatory reality, many countries where land use change is a key element of their emissions profile will have a renewed focus on reducing deforestation and forest degradation. Considerable funding will be funnelled into these efforts and there will be an increased focus on the contribution of the land sector to carbon sequestration. It is also likely that these efforts will only magnify over time as countries update their INDC pledges to limit warming to well below 2 degrees. Following the Paris Agreement, companies committing to action on deforestation and forests degradation will increasingly enjoy competitive advantages as a result of shifting policy. Conversely, companies whose business model for production or purchasing is reliant on unsustainable deforestation or forest degradation will be more at risk. Katie McCoy is Head of CDP’s forests program.